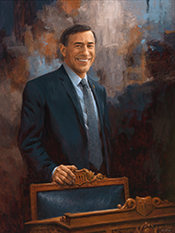 A Representative from California; born in Cleveland, Cuyahoga County, Ohio, November 1, 1953; B.A., Siena Heights College, Adrian, Mich., 1976; United States Army, 1970-1980; business owner; elected as a Republican to the One Hundred Seventh and to the six succeeding Congresses (January 3, 2001-present); chair, Committee on Oversight and Government Reforn (One Hundred Twelfth and One Hundred Thirteenth Congresses). Siena Heights College Founded in 1919 as St. Joseph's College for Women by the Adrian Michigan Dominican Sisters. In 1939, it was renamed as Siena Heights College after Saint Catherine of Siena.